A few weeks ago I got to sub on one of our other circus units and finally get out of California for a while (we’ve been here 3 months – that is a really long time in one area for a nomad). 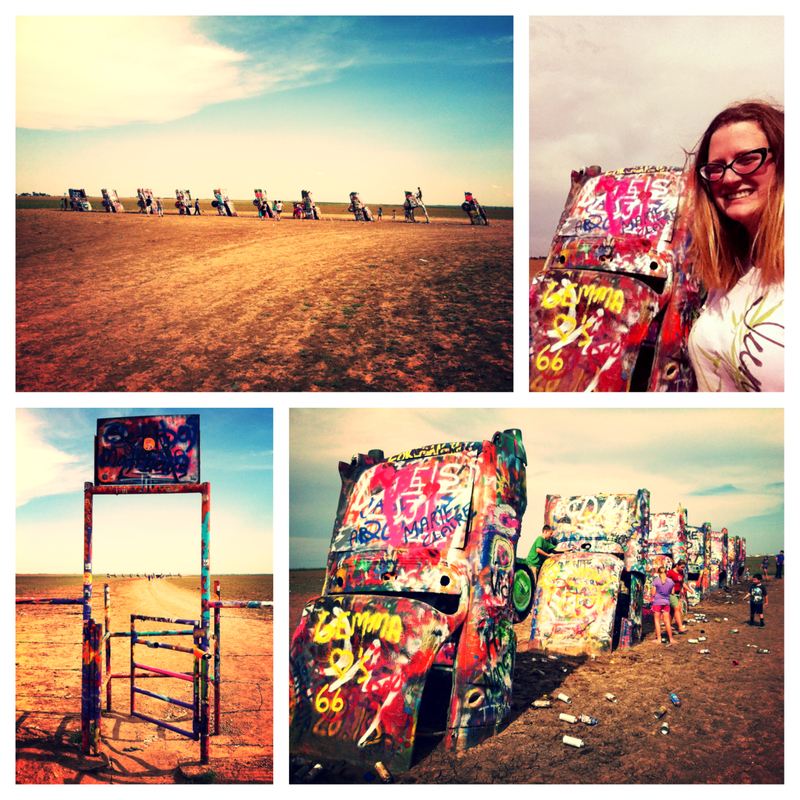 It was also my first time ever in Texas (other than catching connecting flights at Dallas-Fort Worth airport) and I was pleasantly surprised by the roadside oddity I found known as Cadillac Ranch (especially since it’s in my book 50 Places to See Before You Die and 50 Places That Are a Lot More Fun and I’m trying to get to every stop in there). This brings my grand total of weird car related roadside attractions to 2. 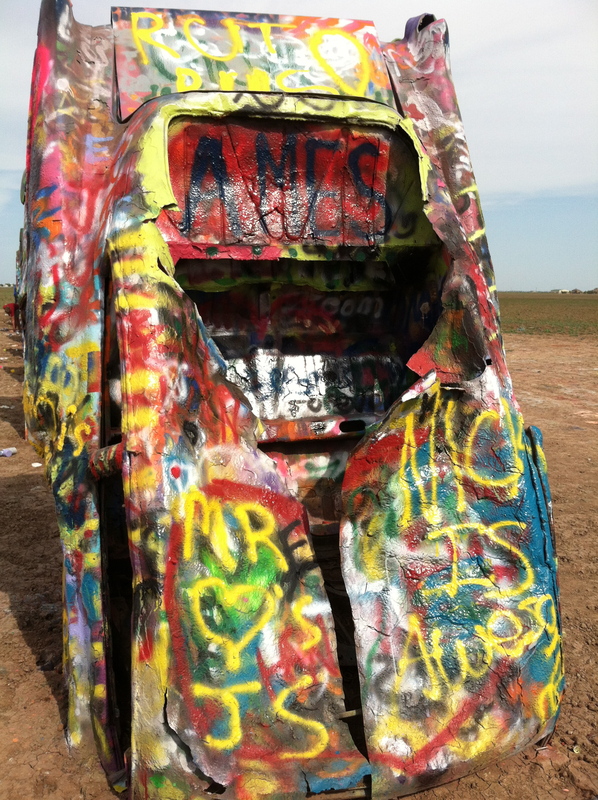 Tip – Bring a can of spray paint with you to the Cadillac Ranch and leave your mark. This was, by far, one of the easiest roadside attractions I’ve ever found as it is actually right on the roadside of the major highway (Interstate 40) going through Amarillo. You can exit either right before or after it and just go down the road next to the highway, park there and walk right up to the row of partially buried Cadillac’s covered in spray paint. Cadillac Ranch was created in 1974 as some sort of art installation project by Chip Lord, Hudson Marquez and Doug Michels. They buried the cars partially in the ground at the same angle as the Great Pyramid of Giza in Egypt… like you do. Now some millionaire owns this land and moved the art installation from it’s original position onto his giant patch of dirt to keep it safe and cherished for many generations to come. Evidently, the thing to do is to visit the Cadillac’s and spray paint them. The fact that some local kid hasn’t set up a spray paint stand near the entrance is astonishing to me. I was totally unaware that you could spray paint these things and would’ve happily shelled out $5 for use of some spray paint to immortalize my visit… until it was painted over by the next day’s visitors. Definitely worth a visit if you’re in the area, but not worth a big detour in it’s own right (unlike Carhenge – the more awesome of my two car related roadside adventures). Another strange site seen by this intrepid Americana explorer. 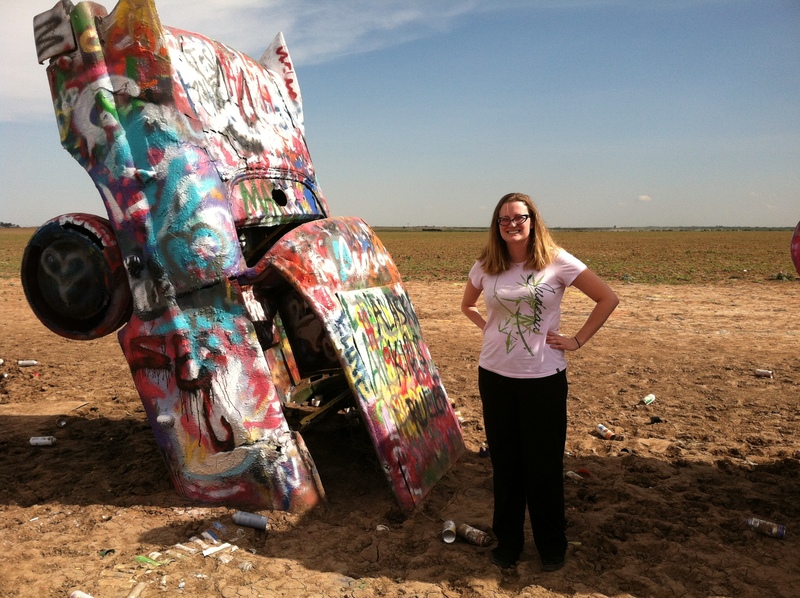 If you want to learn more about Cadillac Ranch, you can check out the website here. Or for a more Texan tour of the area, check out Brooks & Dunn’s music video for Honky Tonk Stomp, shot on location at the Cadillac Ranch. This entry was posted in Roadside Attraction and tagged amarillo, Americana, cadillac ranch, roadside, texas. Bookmark the permalink.